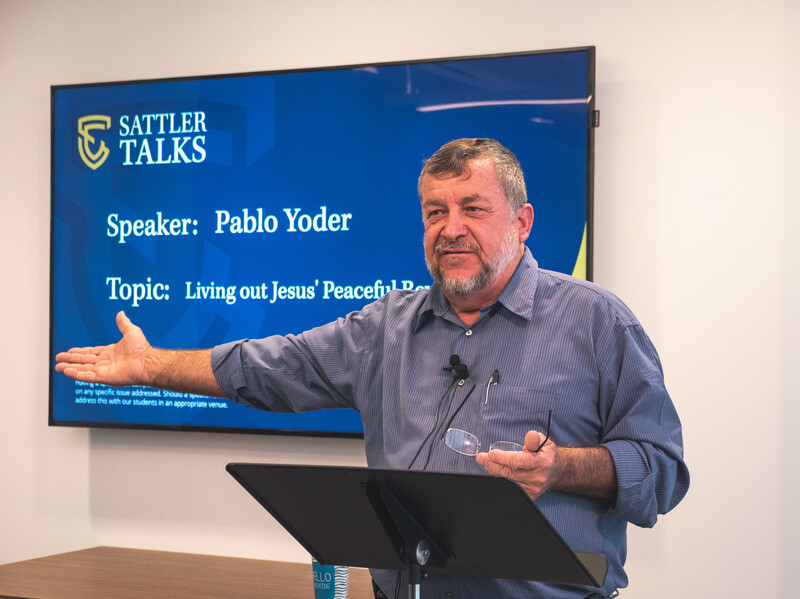 Many people talk of wanting peace, but few have practiced Jesus’ radical peace teaching as fully as Pablo Yoder of Nicaragua. Robbed at gunpoint dozens of times, he has often seen his wife and family dangerously mistreated. But in every instance he refused to offer any resistance but love. 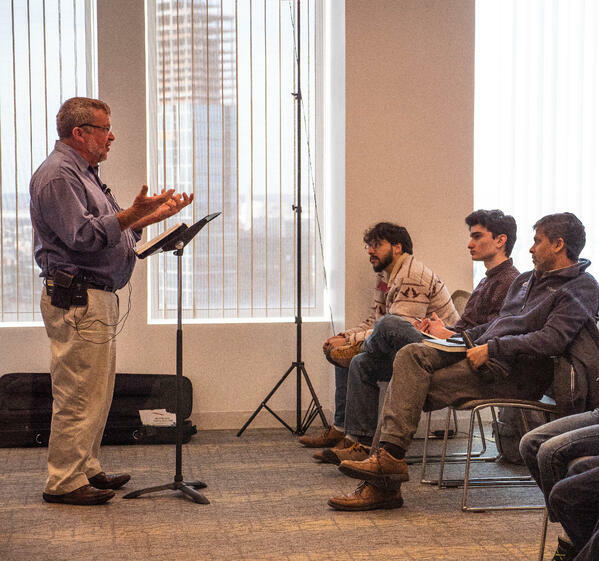 On March 28, Mr. Yoder spoke on “Living Out Jesus’ Peaceful Revolution” to an evening gathering of Sattler students and interested visitors. 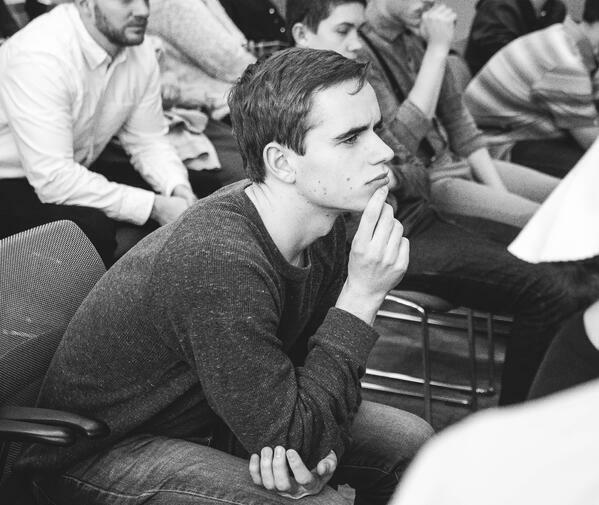 This was the second of the ongoing “Sattler Talks,” a series of lectures by leaders from around the world who are making a difference in our generation. Watch the video or read a summary of his talk below. The commandment to love our enemies is only one of over six hundred commandments in the New Testament. However, Mr. Yoder prefers to call them “ingredients,” likening these instructions to the things needed to make a good loaf of bread. “When we practice these things, it makes sense,” Mr. Yoder said. “Our lives work out better. God’s commandments are the ingredients of a good healthy Christian life.” If we take “love your enemies” out of the Bible, we miss an important ingredient of the life God wants to give us. Mr. Yoder explained that the Prince of Peace had something beautiful in mind when he taught nonresistance. It is contrary to human nature to turn around and bless the person who is cursing you. In fact, it is one of the most difficult things God asks of us. Why would He do such a strange thing? When we are harassed and hurt by others, instead of considering our experience a negative one, we should consider it a “golden opportunity” to show one of these lost children how much God loves them. And these golden opportunities are good not just for our enemies; we should use them wherever we are, whether it’s with a fellow college student or with our parents and siblings at home. God showed Pablo and his family in remarkable ways how valuable their nonresistant responses were for growing His kingdom. Initially, Pablo kept a record in his notebook of every time they were robbed. When they reached 25 robberies, his son pointed out that the number exactly matched the number of members in their small Waslala congregation. Later, when the number of robberies reached 40, they realized there were a corresponding 40 members in the church. To Pablo and his family, this was God’s confirmation that their love to the robbers had born spiritual fruit. Lying there, helpless and in intense pain, “The Lord gave me a gift—I remembered Jesus’ pain on the cross.” There in his hospital bed, Pablo started weeping. “I think you did a ten on that cross,” he told Jesus. Why did Jesus undergo such unimaginable pain? “I think he did a ten because he loved me,” Mr. Yoder said. In the midst of his own pain, he thanked Jesus for suffering on the cross, feeling honored to participate in Christ’s suffering. “Imagine Jesus on the cross doing a ten,” Mr. Yoder said, “and he’s saying, ‘Father, forgive them for they know not what they do.” Like Jesus, Mr. Yoder also experienced what it feels to have someone spit in your face in derision. “I can still feel spittle running down my face,” he said. Yet, in spite of mockery and excruciating pain, Jesus was not concerned primarily about himself. Even from the cross, he cared for his mother. “Mama, here’s your son,” he told Mary, and to John, “Son, here’s your mama.” His love was so big it controlled his desire to scream and writhe in pain. His love in the face of pain and mockery convinced one of the thieves crucified beside him that this man was not only innocent, he was divine. Mr. Yoder shared many more experiences of personal on-the-ground love in the worst kind of situations. This blog can in no way do justice to the power and passion of his storytelling—so for a fuller picture, watch the video included in this post. You will find it well worth your time. He ended his talk by challenging his audience to ask themselves if they loved Jesus. Had that pebble come and smashed into their hearts? Was Jesus’ love rippling outward from them to others? Pablo Yoder grew up in the Shenandoah Valley of Virginia and moved to Costa Rica as a child. After marriage, Pablo and his wife Euni were blessed with six children and moved to plant a church in Waslala, Nicaragua. Between 1995 and 2000, the Yoders experienced over 40 robberies. Pablo wrote about some of these experiences in Angels in the Night and Angels over Waslala. Other works include The Long Road Home, The Work of Thy Fingers, My Father’s World, and The Death of a Saloon.